There’s a reason Thanksgiving is celebrated with pie and not cake. Cake is a hands-off affair—combine the dry ingredients with the wet in a mixer and leave it to the oven. With pie, the baker feels the flour and butter and water come together to form something greater than their parts, and then scrapes and sculpts and rolls out a delicious disc of dough that will contain seasonal fruit, autumnal gourds or nuts suspended in sweetness. “I really love to bake for people. 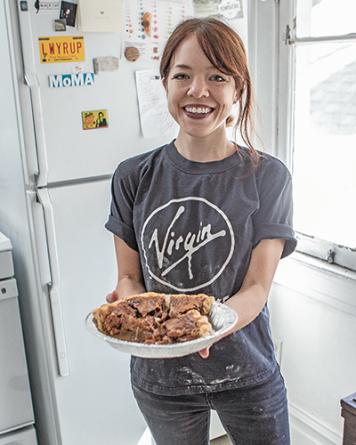 It’s a kind of love language for me,” says Kelly Greenwood, who recently turned a near-lifelong hobby into the side hustle Night Shift Baking Co., where cakes and pies are made to order. 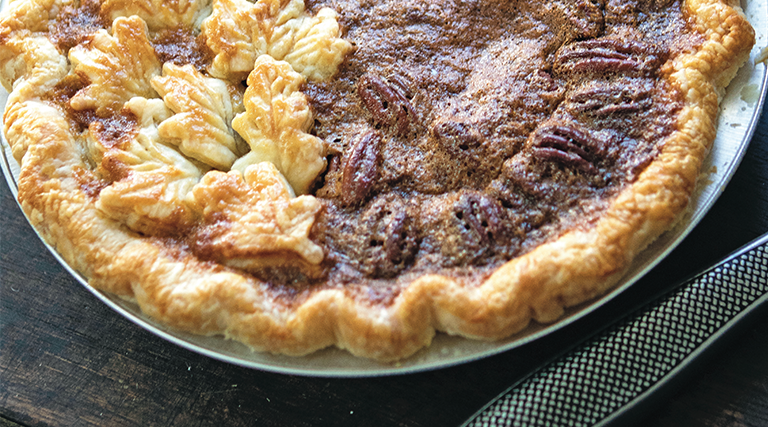 Greenwood invited Devour into her Avenues kitchen to show step-by-step how to make a boozy black-bottom pecan pie that should earn a spot on your Thanksgiving table. 1. 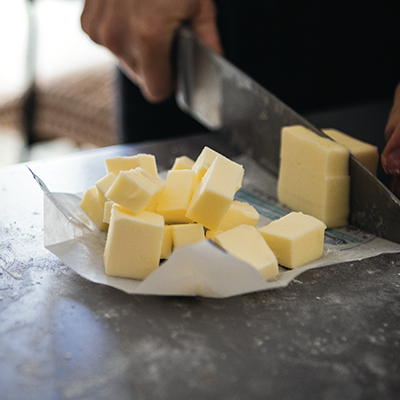 Chill out: European butter works best because of its higher butterfat content, but whatever you buy make it unsalted. Cut the stick of butter the long way into fourths, and then into cubes about 1/4 of an inch, and freeze it overnight. Warm butter=too much gluten=a tough crust. 2. 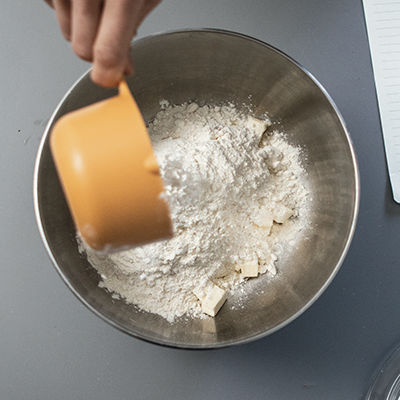 Scale up: Measure the flour, sugar and salt using a scale—a critical element of baking. Even if you measure a cup of flour carefully, the amount will be different from cup to cup. Not so when you measure by gram. 3. 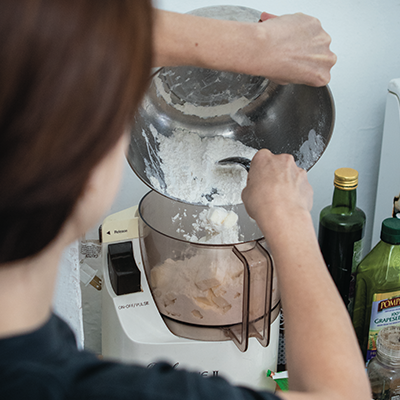 Shake it up: Pulse the dry ingredients with the butter in a food processor just until the pieces of butter are about the size of a pea. Any bigger, and the butter could melt out while the pie is cooking. You could do this by hand with a pastry cutter, but the metal blade of a processor does it faster. 4. Hydrate: Turn out the butter mixture into a large bowl. Combine vinegar with ice water (really, keep the water cold with ice in the fridge until you are ready to use it). Vinegar isn’t traditional, but it helps inhibit gluten from forming, leaving the crust flakier, she says. 5. Slow down: Gradually drizzle in water mixture by hand, not with the processor. 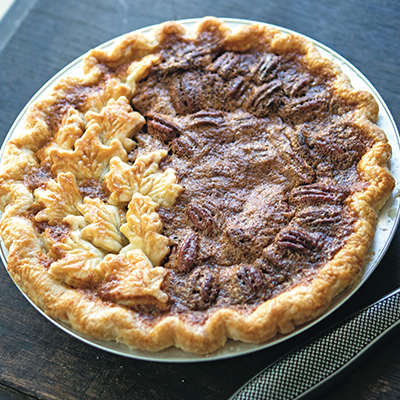 “It’s getting to know your pie crust and feeling it while its hydrating,” Greenwoodsays. Scoop the flour mixture over the water, avoiding getting your hands wet. Continue to add water and mix until it starts to clump together. It should feel moist, soft and pillowy. 6. 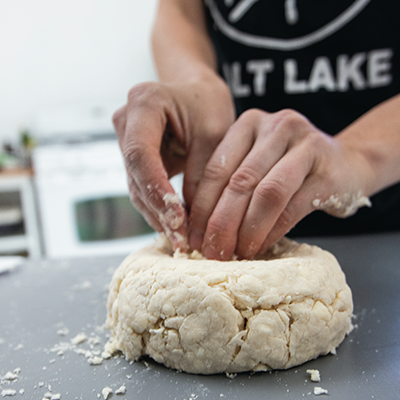 Mold and freeze: Turn out the dough onto the counter and form it into a ball. 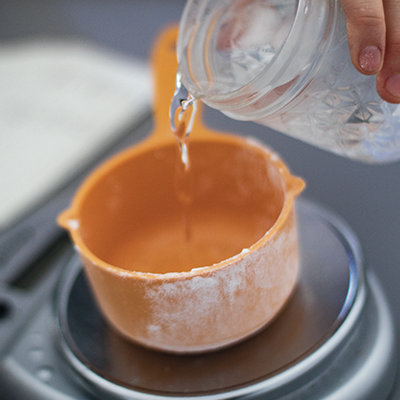 If it needs more moisture, create a small well in the center for thewater, scraping any dry ingredients from the edges onto the top. Mold it into disc, cover in plastic wrap and stick it in the fridge for at least an hour and preferably overnight. To speed the process, freeze for 30 minutes while you make the filling. 7. 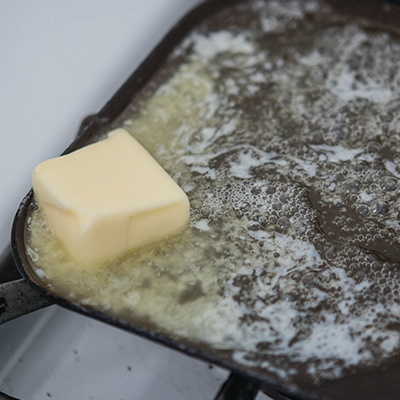 Fill it up: Melt the butter. The microwave is fine, or brown it on the stove over medium heat if you like the nutty flavor of browned butter. Stop when it starts to brown lightly and becomes fragrant. Set aside. 8. 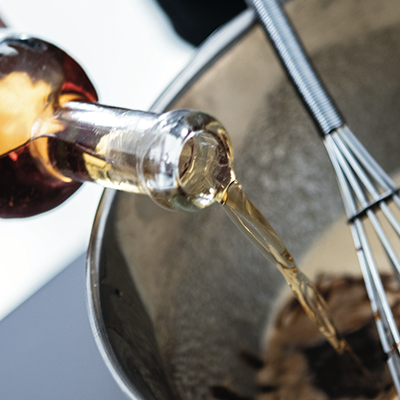 Whiskey, please: In a large bowl, whisk the eggs, granulated sugar, brown sugarand salt together with awhisk until well combined. Add corn syrup, molasses, vanilla and bourbon, scraping down the sides as necessary. Greenwood prefers Utah’s High West Prairie BourbonWhiskey, and she likes the complexity bourbon brings to the pie. Whisk in flour as a thickener and add the melted butter. Set filling aside. 9. 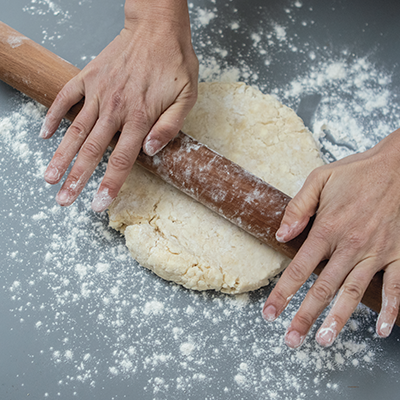 Roll with it: Sprinkle some flour onto the counter and roll from the middle, wherethe dough is coldest. Turn it 45 degrees and roll if the circle becomes lopsided. 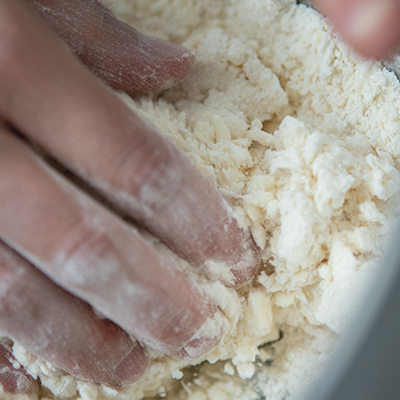 If the edges come apart, pinch them together, and add a little flour to patch any gaps. You should see different-sized chunks of butter in the dough. Roll the crust out to 1/8 of an inch thick. 10. 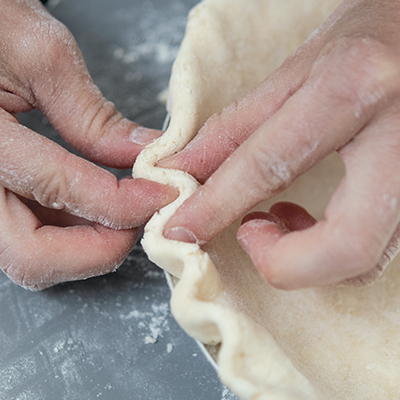 Fold and drape: Gently fold the dough in half to move it to your pie pan. Line it up with the middle of the pan; it will drape over the sides. Cut the edges, keeping the crust long enough to touch the table. Keep the scraps in the fridge to make a decorative top. 11. 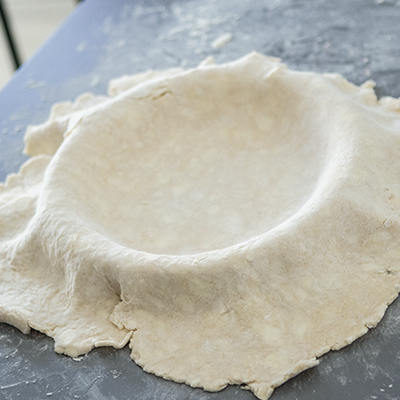 Flute the edges: Fold the edges of the crust under itself so that the dough sits about a half inch above the pan. Flute the edges by pushing your thumb from one hand in between the thumb and index finger of your other hand. 12. Cover with chocolate: Arrange the bottom of the crust with chocolate discs. Sprinkle 2/3 of the pecans evenly on top. 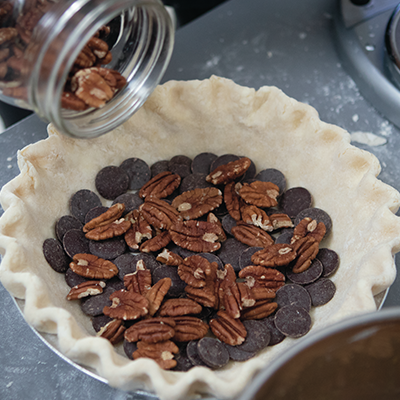 Gently pour the filling over the pecans. Decorate the top with the remaining nuts. 13. Wash it: Make an egg wash by whisking together the egg and heavy cream. 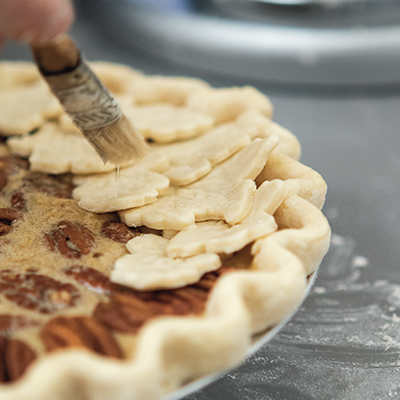 Brush the edges and top of the crust to give the pie a nice brown finish. Place in the freezer while you roll out the extra dough and stamp or cut out leaf shapes. Add those to the pie and brush with the egg wash.
14. Finish: Bake at 350 degrees for 60-75 minutes, or until golden and the middle is set, puffed up and just slightly wobbly. Cool for a few hours before devouring.